When clients from Broadmayne in Dorset wanted to replace his existing back doors he already knew he wanted Origin Bi-fold doors. 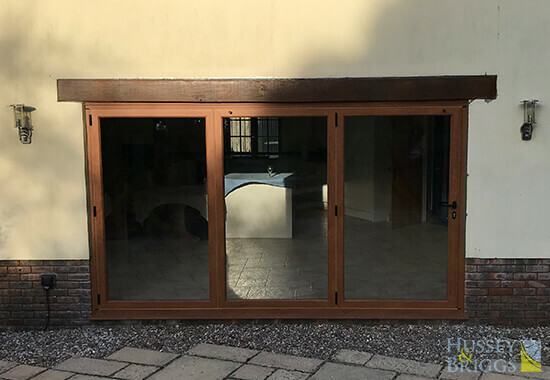 Bi-fold doors are a great addition to any kind of property. The doors expansive glass panels offer you extensive views helping to bring the outdoors in. Not only do they look good, but they are built to last (comes with up to a 20-year guarantee) have a great security rating. They also offer great flexibility with sizing and you can choose the number of doors along with how you want them to open. They opted for an Origin 3 pane Bi-fold door. Keeping your home safe is a key factor for any homeowner and security was a major factor in why they chose Origin. These Bi-fold doors come equipped with heavy-duty zinc hinges which are designed to resist attacks from the most determined intruders. Origin Bi-fold doors also offer an 8-point locking system (on doors taller than 1125mm in height) which conforms to Secure by Design standards. There is also the choice to upgrade to one of the 3-star British Kite Mark barrel options, which our client choose, for added peace of mind. All these quality features along with a strong aluminium frame create a door system where security is second to none. Colour choices were also an important factor for this client. Origin Aluminium Bi-fold doors come in a choice of over 150 PAL shades so there is something to suit every taste. You can also choose from one of four realistic woodgrain finishes. This means you get the benefits of premium grade aluminium without the high maintenance and costly upkeep of real wood. And you don’t have to pick just one colour. These bi-fold doors are also available in a range of dual colour options. Our client wanted a match as close as possible to his original internal and external door colours. He chose Golden Oak on the outside and Natural Oak on the inside to compliment his property’s existing looks. And the little details aren’t overlooked either. There is a choice of hinge colours, while the colour coded gaskets are available in 7 different colours. And no door is complete without its handle. Origin offers a choice of modern and elegant styles which compliment any choice of door colour. With this property, these bi-fold doors really have provided the best of both worlds. Traditional looking door frames but with all the features you would want and expect in a modern door system.